A friend sent me this link. This could be true in any state. 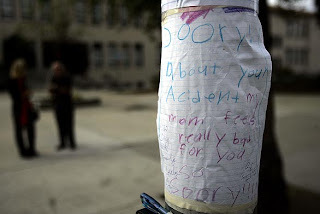 "Sorry about your accident. my mommy fells really bad for you. so Soory!" An apology written to Meri Nalbandyan from the daughter of the woman who had killed her. The mother had dropped her own (letter-writer) daughter off at school moments earlier. In a moment of inattentiveness, she drove her SUV at 10 mph over 11 year old Meri at the mid-block crosswalk pictured below. As I wrote in Walking and Biking, "Stop the madness". 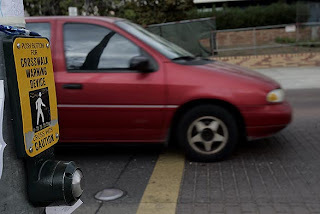 Traffic accident statistics prove time and time again, children who are hit by cars near schools are usually hit by cars driven by people picking up or dropping kids off at school. If more kids walk or bike to school, there would be fewer cars in a dangerous scrum around schools every morning. The comments accompanying the LA Times story are dispiritingly illogical. One blamed cell phones even the story explicitly states that the driver was not using a cell phone at the time. Another comment said that kids were being murdered and kidnapped so much more these days, there was no alternative to chauffeuring them to school. No one dares to suggest that we get the cars out of the school zone. Minivans have smaller blind spots in front of them because their hoods are much shorter and slope down so steeply. Minivans are wedges on wheels, which is why they enjoy higher gas mileage than the blockier SUVs. In addition, the engines of minivans ride much lower than those of SUVs, giving minivans a lower center of gravity, decreasing their likelihood to roll over (relative to SUVs). The companies that foisted SUVs upon the public as the family vehicle of choice are on life support. Explain to me why we shouldn't pull the plug. I bought a medium-sized and a small pumpkin, but Iris did not want to make the scary extreme pumpkin combo. She felt more comfortable painting her small pumpkin. My set only had two sizes of tips, none small enough for carving around the spider legs. 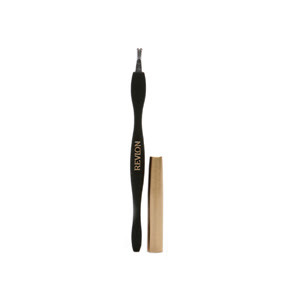 Cuticle trimmers look about the right size and shape. It worked. Iris wanted to try out the linoleum cutters. I had been working for a while by that point and really needed to visit the bathroom. I left her at it and ran down the hall. I was gone less than a minute before I heard a cry. How did she manage to cut her thumb with a linoleum cutter in such short time? Fortunately, the cut was superficial. A friend from Boulder visited us last weekend. He drove with the top down through Utah's canyon country and several mountain ranges all decked out in fall colors . We will call that his pumpkin chariot. Iris says that this will be our best pumpkin ever. I asked her how she can be so sure. She says it is because we never do the same pattern twice. She says that the best thing about our pumpkin is that it has a pumpkin inside of it, just like the extreme pumpkin, only not so scary. So I guess it was a four pumpkin weekend. A good mother would not have a 7 year old child still bouncing off the walls at 10 PM on a Saturday evening. A good mother would have read to her children starting at 8 PM and had them asleep by 8:30. A desperate mother might coax said child to bed by inviting them to listen to a radio play. A wordy radio play (in British accents!) seems unlikely to succeed, but the operative word is desperate. Last night, we listened to the half we missed Saturday night, using the laptop in bed. I must have dozed off because Iris had to explain the irony and ambiguity of the ending to me. I like the tagging and cataloguing capabilities of Library Thing. But my library is heavy on the reference/craft books and books I haven't gotten around to reading yet. Books I read and loved were likely passed on to friends who simply must read it, too. Books I read and didn't love were traded in at an used bookstore or donated. What about the read borrowed books? Goodreads lets me shelve books by status (read, currently reading, to read). I can stop using my amazon wishlist to remind me of the books I want to read. Where does one find the time to catalog all one's books? I finally got around to culling our cookbook collection and adding them to Library Thing. However, only about 30-40% of our home book collection has been added to LT.
For Goodreads, I will only add books as I read them, or to maintain a list of books I would like to read someday. Michael Pollan brings up an interesting point in Farmer in Chief, an open letter to the president-elect. That's part of the impetus towards eating local. Most people can intuitively see that it takes so much energy to move food all over the globe. But many are absolutely clueless about the amount of petrochemical input into our food. It turns out, the old way, with solar-powered energy input, is the more sustainable way. It is time to move our food production system back to solar power. More Michael Pollan advice at Unhappy Meals. Read a conversation with small farmer at Conversations with America: Ethan Book. Go read the entire charming interview. (I can just see that chicken running around with the hogs.) He blogs at Epi Log. From Grant McCracken via Dynamist. In the surging modality, consumers have momentum. We have a vivid sense of forward motion. Life is getting better. Each purchase is an improvement onthe [sic] last one. When consumers slow down and begin to concentrate on the here and now, the what and the where of their activity is often the home. Dwelling is what consumers do instead of buying. And in a sense this reverses the Scitovsky effect. You will remember Scitovsky's book The Joyless Economy and his argument that the trouble with a consumer society is that the pleasure of ownership soon degrades into mere comfort. It's not long before we take our new possessions for granted. What the consumer does in a down economy is roll back the Scitovsky effect. We begin to treasure things. We re-engineer the comfort to get back to pleasure. We begin to savor things again. Read more at What Consumers Do in a Downturn and Finding Joy in a Joyless Economy. Gee, I must live in a perpetual recession. ;-) Seriously, we should take a breather to enjoy the things that we do have every day, not just when we run out of money or credit. This morning, we enjoyed home-made apple-persimmon cake, and lattes for breakfast. Then I made chicken broth with last weekend's roast chicken carcass, some veggies from the farmers' market and the grocery store 300 feet away, and a bouquet garni from the backyard. (The fence is rotting and weeds need pulling, but it is still a pleasant and productive yard.) I used knives and pots we received as a wedding present 18 years ago. The scratched bundt pan is even older. My mom gave it to me when I moved out, but I have been baking cakes in it for 30+ years. Afterwards, I attended Bernina Sewing Club at AAA Sewing and Vacuum. This month's topic: refashioning clothes. Sounds like Bernina is capturing the zeitgeist to sell more presser feet. It worked. 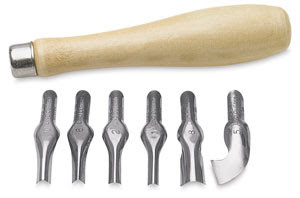 I bought another presser foot for my growing collection. I also bought Volumes 2 and 3 of the Bernina Feetures books, the instruction manuals that should have come with my machine. It irks me to no end that they charge $50 per volume ($150 total) for manuals that show you how to install and use the feet ($$-$$$) and machine ($$$$) that they sold you. At least I used a coupon (see asides below). I do not find the Bernina "live" webcasts useful at all. Why bother doing it live if the instructor just plows through the material, won't take questions, and hangs up immediately after doing her demo? I pay for the class mainly to learn from the live instructor, Suzy Poor. She demonstrates the techniques again, and more slowly. She also shows alternate techniques for similar results. If you live in the area, consider signing up for AAA Sewing and Vacuum's email list. Aman and Amina won't spam you; they send a monthly digest and the occasional coupon. Yesterday, they sent out a coupon for 25% off everything in stock at the store. Bernina debuted their new website. Where did they put the instructional information? Good question. I couldn't find it either. I emailed them and, a day or so later, they directed users to click on See It!/Share It! on the left hand menu. Then select Presser Feet Videos from the submenu that appears. Of course, there are no webpages that show the uses for each feet along with the possible range of settings and a few illustrative pictures. Instead, you need to have broadband to watch a very short video that has a very low information to bandwidth ratio. I wonder who designed their webpage? My 7 year old can do better. Actually, remember the unnamed electronics company that tested their new products/user interfaces on kindergartners, including Iris? (If you don't remember, read Child Labor II. Bernina could learn from them. This morning, I participated in a telecon for a team studying a national safety issue. While we were waiting for all the participants to dial in, some of the others debated who was more entitled to "senior moments". I learned that I was the only team member under 65. I am used to being the only woman. I am used to being the youngest. I am not used to being the youngest by almost 25 years. They all treat me very well; they know that I write most of the software for the data analysis and do the bulk of the data fusion and visualization work. The professors have graduate students; the senior scientists at national labs leave that kind of work to their subordinates. I am that sandwich generation of technical workers that I wrote about in Opting Back In. Although the aerospace and defense industry has made a concerted effort to attract new employees, there is a large gap in the 30–40-year-old range, where it is estimated that supply is actually 29–46 percent below demand. These are the people with theoretical as well as practical knowledge—the individuals who will be the program managers, both in industry and on the government side in the next 6–10 years, and the concern is that there may not be enough of them to fill vital positions. I am grateful for the opportunity to work with and learn from so many distinguished scientists. I just wish, for the sake of knowledge transfer and my workload, that the budget included more young and mid-level scientists. Not a Hollywood star with one nanny for each child and a spare for the other nannys' days off? Not a major donor to our fabulously wealthy governor who campaigned on a platform of independence from donors, yet has raised more campaign money than any other governor in CA history? Your employer didn't buy a table to curry favor with the governor? Then perhaps you didn't score a ticket to the Women's Conference©. Fear not, Sandra Tsing Loh would like to invite all you public school moms out there to join her outside the Women's Conference© to pass out muffins to those fabulous leading women who send their kids to private schools. WHEN: 7:00 - 8:00 a.m.
O Wear a festive apron if you like--you are a public school mother, you bake! ----> It’s a fun half hour offering a morning muffin--with a message stapled on--to incoming "women’s conference" attendees. . . At 9, you’re done! Will we be talking about this on public radio and beyond? Of course! © 2008, The Women's Conference. The Women's Conference© is carbon neutral because they bought offsets. Our governor flies from his LA area home to Sacramento round trip every day in his private jet. But he buys offsets for that, too. I wish he would donate the money to Iris' public school so she doesn't have to squeeze in with 38! kids in her classroom. I need to get one more thing off my chest before I can breathe deeply and go to sleep. This morning, I heard a woman on the radio talking to someone who referred to the "global warming hoax". She countered that the polar ice caps are melting. The man asked who cares? She could only mumble something about how she supposes the polar bears care. Big sigh. It is clear that scientists are not getting through to the media. Let me try to explain why we all need the polar ice cap if we plan on continuing to live on this planet. This is the oft-distributed graphic showing the Earth's radiative budget (that is a fancy term for energy in--energy out) from the Intergovernmental Panel on Climate Change (IPCC) report. The units are watts per square meter, Wm-2. Globally averaged, 342 Wm-2 of energy from the Sun hits the earth and clouds reflect 77 Wm-2. 30 Wm-2, almost 10%, are reflected from the surface. From the vantage point of the sun, the earth appears as a disk (area = πr2 ), with a reflective ice cap in the middle, instead of a sphere (area = 4πr2 ). The earth's rotational axis is tilted so that the poles point toward the sun. The polar ice caps are responsible for much of the 30 Wm-2 that reflect back out into space. Now visit the Sea Ice in Retreat web widget and see how the polar ice cap has shrunk in the last 10 years. You might wonder, what is the big deal if the Boreal summer polar ice cap covers only one half to two thirds of the area it used to cover? Does it matter if they reflect only 7% of the Sun's incident radiation instead of 9%? 2% is small potatoes! That 342 Wm-2 (with minor variations in solar sunspot activity) is an average over the entire Earth's surface, 4πr2 , on both the day and night sides. You can bet that the solar radiation density for the part of the earth pointed directly at the sun is quite a bit higher than 342 Wm-2. For extra credit, calculate the surface area of the earth and figure out how many extra watts we will get without the ice caps. Use an average for the earth's radius, say 6378 km. Simply put, without the polar ice caps, we are all gonna fry. Click on the Cloud Cover tab; we can discuss the significance later. We had house guests 3 weekends in a row, which means I don't have much sewing or knitting to show. We mostly recuperated this weekend. I want to post a quick link to a Scott Simon's interview with actor Terrence Howard. Though I had seen his work, I was not very familiar with him. That searing interview changed everything. Scott Simon wrote, "I have interviewed thousands of actors over the years. None have been as eloquent, illustrative, or fascinating as Terrence Howard." Best of all, there is a video of most of the interview. When Howard talked about his mother's death, and catching himself watching the moment like an actor instead of a son, it was riveting. He also spoke about how he had set out to be a scientist instead of an actor. But life has unexpected twists. He has certainly thought deeply about science though. He pointed out things that I had not thought about. Howard's deep explanation of the soap bubble reminded me of the first chapter in the Feynman lectures on physics, when Feynman makes an aside about molecules constantly colliding with one another and exchanging energy. It was just a throwaway aside to Feynman, but it captured my imagination enough for me to devote my PhD thesis work to it. Quite a few people, e.g. Mardel at Purls and Murmers, mentioned the spectacular Autumn color show in the northeastern US this year. The colors are so vivid, they are visible from space. 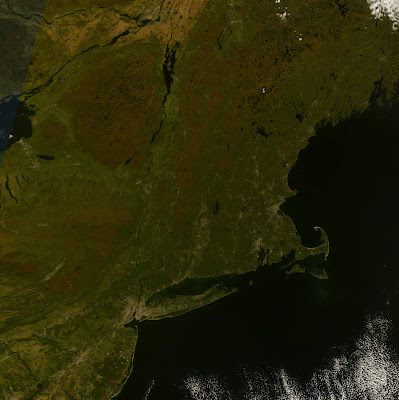 Please visit the MODIS image of the day web page for this image. If you put your mouse over the picture, it will switch a picture of the same region in full June greenness. It takes 20-30% longer to process visible & IR spectrum satellite imagery in June, when compared to January, because of the rapid changes in land surface as the Boreal (Northern Hemisphere) summer plant growth kicks in. It's not the greenness, but the fact that the scenery is changing so fast at that time of the year. If the Earth's major landmasses were mostly in the Southern Hemisphere instead of in the NH, then globally-averaged changes would be more rapid in January and the reverse would be true. Iris and I toured Privateer Lynx yesterday. It's actually a 2001 replica, used to teach history to children. Below decks in the main hall. The other side of the hall. Iris is getting ready to take off her shoes and climb into one of the four berths. Imagine embarking and disembarking on a staircase on wheels with the dock, the boat and the staircase all moving independently. Exciting! We didn't stay for the afternoon sail out into Santa Monica Bay for a mock battle with this ship. I felt safe taking Iris for a free tour (kids are free and they suggest adults put something in the donation box) because Iris had a soccer game later that afternoon. If she hadn't, she would have wheedled and begged to be allowed to set sail for the mock battle, which is not free. We parked at the northern end of King Harbor at the Redondo Beach Spectrum Club. Didn't the sky look beautiful yesterday? I meant to take Iris for family swim this afternoon at the pool with this harbor view, but the fog rolled in and neither of us felt up to braving the 65F air. That's frigid, by Los Angeles standards. It would have been nice today to have taken her to play in the sand and surf at Hermosa Beach, then walked over the the Spectrum Club RB for a swim and a shower, then stroll down to the RB pier for lunch--but it didn't happen. I shopped at Target, Trader Joe's, and Mark and I cooked up a storm. We have gigantic pots of cream of mushroom soup and minestrone soup, fruit salad and two types of home-made salad dressing. Two more persimmons are ripening on the windowsill and I will be able to bake apple-persimmon cake with them soon. Last Tuesday, coworkers lured me to the Manhattan Beach farmer's market at lunch with promises of pupusas. I had never heard of a pupusa, but one Latino coworker raved about the ones from this booth. He's an experienced in-demand engineer so he usually works through lunch. If he makes time for this food, it must be something. 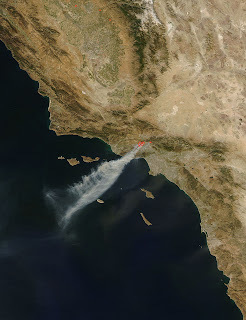 Unfortunately, remember this image (from the MODIS image of the day website)? The pupusa vendor could not make it that day due to all the fire-related road closures. At least I got the ingredients for this weekend's cooking frenzy. I will have to go back and try again next week. I must try to remember to bring my sewing scissors because there was a man sharpening knives and scissors at one booth. Apple Persimmon cake is make in much the same way as the Swedish Apple Cake recipe I posted earlier. Just substitute one apple and the pith of two soft persimmons (I prefer the pointy and sweeter Hachiya ones) for the 3 cups of chopped apples. Perhaps I should just repost it. 1 Cup chopped nuts (I like walnut pieces). Stir in 2.5 to 3 cups of flour until batter is stiff. Grease a tube or bundt pan with salad oil, spread the lumpy batter as evenly as possible. Bake at 350° F for 1 hour or until toothpick inserted in center comes out clean. As you can see, I cook improvisationally, using my senses rather than adhering strictly to a recipe. Iris was kind enough to share an entertaining item about school, so it would only be fair to share one of mine. The whole point of dumping German to study Latin was because I longed to be freed of all the myriad grammatical rules. Latin was even worse. After learning the fourth declension, I saw that there were three more to go. It was too demoralizing. Someone should tell all those kids studying Latin to help raise their SAT scores that mine went down after I took Latin. That should be proof that English makes no sense. Are We Rome? Tu Betchus! And I have some great stories to tell about me and Shakespeare! Iris has spent many recesses in the "opportunity room" lately. I asked her, "What is the opportunity room?" "Yes, but who goes there and why?" "We go there to write letters apologizing for what we did." How did detention become an opportunity? So far, the letters are about forgetting to bring her homework home or back to school or for not paying attention in class. She sometimes finishes her homework packets early. I tell her to turn the homework in as soon as she finishes it so she doesn't lose it again. She says she won't lose it; she will put it in her desk. Guess what is not there when it is time to turn it in? * She thinks she goes there only about twice a month. I think we sign her letters acknowledging her transgressions almost weekly. ** I asked for her permission and received it before writing this post. As children get older, they get touchy about their privacy. We both thought this was an amusing story, though. 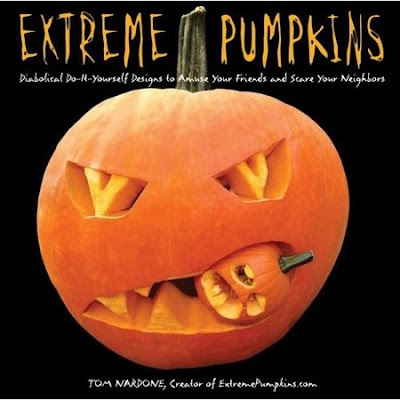 Last autumn, Iris and I found Extreme Pumpkins on the "new books" shelves at the Redondo Beach Library. It helped us take our pumpkins to the next level. Or maybe, to outer space? Anyway, Tom Nardone has a sick and twisted mind. Buy his two books, Extreme Pumpkins and Extreme Pumpkins II so that we can keep him off the streets. Buy the books by following the link on either his website or on the RB Library website, so that they can get a percentage of the sale. We listen to a great deal of NPR (aka National Proletariat Radio in Omaha). We also read the LA Times. Like many families, we have been discussing the global financial meltdown. What I didn't expect, was for Iris to pipe in with useful suggestions. How did a 7 year old come by her financial wisdom? 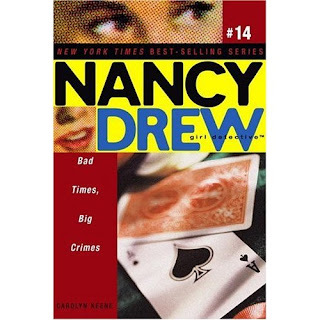 From Nancy Drew, of course. In Bad Times, Big Crimes, Nancy time travels back to River Heights, circa the great depression. She finds her hometown in desperate straits and the populace easy prey for crooks. Iris learned that the great depression was characterized by a lack of money, but not necessarily lacking in opportunities. For instance, the school district didn't have money to pay a teacher, the teacher couldn't pay her rent, and she ended up living in one of the shanty-towns nicknamed "Hooverville". The kids went without schooling. But, Nancy thought, what if people paid the teacher in goods and services instead of money? In another case, the grocer needed help, and a teenager's family needed food. The grocer didn't have money to pay for labor and the family did not have money to pay for food. She brought the two together and suggested a swap of the teen's after school labor for groceries. Iris said that all the stories recently talked about a lack of money, which may be true. But we have other things of value besides money. Remember the scene in I know where I am going when Joan Webster calls the locals poor? Torquil MacNeil answers, "They aren't poor, they just haven't any money." There is a difference. If ever there was a time to shop your local small businesses, it is now. 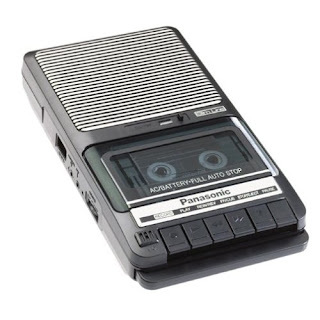 We bought Iris a shoebox type cassette player and recorder when she was a baby. Before we left on business trips, we read and recorded stories so she could hear our voices while we were away. We also have an adorable tape of her early reading efforts. The sound quality is not great, but it it easy to operate. Lately, she has been writing and recording her own songs with it. She also commandeered all the cassette tapes she found in the house. I was astonished one day to find her intently listening to the Brahms Double Concerto in A minor. I forgot that I even had it on tape. I recorded it off of one of my mother's albums and took it to college with me in 1984. Now my daughter says it is one of her favorite pieces of music. Check out Clambrush's extraordinary recordings of David Oistrakh and Mstislav Rostropovich playing Brahms' Double Concerto for Violin and Cello, Op. 102 with the Moscow Philharmonic led by Kirill Kondrashin. It's a four-part video so go to the YouTube page to see them all. The mommy and me Suzuki violin lessons are not going so well. Neither of us have the discipline to practice daily. We will get Mark to take pictures of us playing together. Iris and her (rented) 1/4 size violin is adorable. I have been cleaning out our family's wardrobes slowly all summer. It does not make for exciting and photogenic blogging. I made an effort to fix things that prevented me from wearing much of the stuff I already owned. I reworked several tops by nipping them in at the waist, let out some waistbands and hemmed about 6 pairs of pants and a couple of jackets. I am still trying to figure out what my "real" body size is. Almost 8 years post baby, I still don't know. One illness and I can drop 15 pounds again. One injury and I can gain 10 pounds. One holiday and I can gain 5 pounds from sampling all the food. I donated several bags of stuff I wasn't wild about and wasn't wearing. I said goodbye to some worn out clothes. Iris claimed some of the stuff that will probably be forever too small for me. I polished all my belts and shoes. I probably should have done it more often because the leather cracked on several items. One belt had disintegrated to goo. Yuck! Iris and I had fun using touch up paint on some of the 1980s Beene Bag shoes in purple and green. To my surprise, a clothing inventory showed that there were actually gaps in my wardrobe. For instance, I didn't have basic black or brown belts in my current size. Mark has no blue or green sweaters even though blue is his favorite color and he has the most amazing deep green eyes (framed with long lushy eyelashes that he uses to his advantage whenever needed). Cidell and Carolyn wrote about cleaning out their closets and showed garments that they made and no longer own. Letting go of clothes that I made is the hardest for me. As I wrote before, they are my portfolio. Here is a red rayon/poly crepe jacket lined in rayon challis. It fits me well, but I don't really like to wear jackets that long and I should have used a nicer fabric. My time is worth it. I wear this cotton jacket in the summer. Don't you love the chevron details? I also treated myself to this reversible wool/lycra jacket for winter. Very graphic, and I can use the pockets from both sides! Remember the Vortex Street refashion project? I took the center cable panel from the Vortex Street Pullover in Norah Gaughan's Knitting Nature and turned it into a scarf. I finally finished it last month. I should have listened to the little voice that told me to STOP and rethink my approach. Like Mardel, I tried to force my way to the finish line and regretted it. The placement of the scarf collar was not based on fit or a flattering silhouette, but on minimizing the number of moth holes I needed to darn. Laziness will get you ever time. I did lay the sweater out with another sweater to figure out the overall length. That told me that I could turn up the sleeves at the beginning of the ribbing. I blind-hemmed the ribbing to the inside of the sleeve by hand. The width looked like it would be fine, also. I cut the neckline and then serged all around the opening. Why didn't I just mark the cutting line and serge along that line? That would have helped alleviate the stretching problem. My excuse was that it was late at night. I vaguely recall learning how to reinforce neck and shoulder lines with a piece of woven selvage. I couldn't recall which way to place the strip and tried this. Don't do this. It is not the right way to do it! You should really serge the raw edge to the neckline, attaching and finishing the raw edge at the same time. 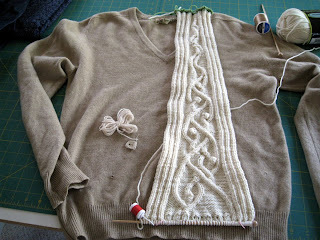 Then I zigzag stitched the scarf collar to the sweater body. Look how wavy and terrible that looks. In broad daylight, I knew that I had to start over. Not only was the seam unattractively wavy and uneven, but the sweater clutched at my hips in a most unflattering way. I undid all the stitching, steamed out the needle holes as best I could. I removed the woven selvage, serge finished the raw edge, and sewed it right side down (to soften the brown color to a tan) with the serged edge up against the serged edge of the sweater body. Much better. Then I used the Bernina "Tricot" foot #12, designed for seaming hand-knits, laid the collar right sides together with the sweater body, and seamed with a 0.5 mm wide zigzag (aka drunken straight stitch). This time, I eased the collar so that the edges went all the way to the center cut edges, which exposed more of the sweater front (and two more moth holes that needed to be darned). I sucked it up and darned some more. I think the results are worth it. It is now a swingy A-line jacket, just like the other scarf front cabled cardigan. And another Pringle cashmere sweater finds a new life. I couldn't find any wool in my stash or at the stores that matched the color of the sweater. I tried to tea-dye some ecru tapestry wool. The color barely darkened. Who left the coffee-maker warmer on? And is that half a cup of coffee in there? I poured coffee over the wool and nuked the cup in the microwave for a minute. Coffee is acidic and wool dyes with acid, right? After the wool had cooled and I rinsed it, the color was perfect. I split the plies of the tapestry wool and darned with single ply. There is cashmere and then there is cashmere. There is no way all the stuff leaving China marked as cashmere is really cashmere. There simply can't be enough goats if you do the math. Most of that "cashmere" is adulterated with merino. The old stuff, when cashmere was a rare luxury and a cashmere sweater was something you saved years to buy, that was real cashmere. Moreover, the natural color fibers are softer than the brightly-dyed ones tempting you to buy a whole rainbow every season. This stuff is "like buttah". Modern fashion should be a reflection of the times. It should be inclusive, reflecting the diversity of the population. It should also be respectful, treating women with dignity and recognizing their intelligence and their busy schedules. It should not insult them with hobbling skirts and debilitating shoes. Diversity is also essential to being a modern designer. Anyone fully and genuinely engaged in the world understands the growing diversity of high-end customers. Designers are constantly on the move, hunting for inspiration, parachuting into foreign cities for store openings and fawning over consumers in Asia and the Middle East. So it is not just politically correct frothiness that should compel a designer to cast a diversity of models in shows, it's also a savvy business move. To do otherwise makes designers look out of touch. Photo above comes from LAT's All the Rage. Let's hope the designers don't demand that the tax-payers bail them out for their bone-headed business decisions, too. Children and youth have long been at the forefront of the country's increasing racial and ethnic diversity. By looking at the racial and ethnic composition of youth, we get a glimpse of what the U.S. working-age population might look like in 20 years if current trends continue. In 2007, 43 percent of people under age 20 were racial and ethnic minorities, and there were 489 counties—about one in seven counties nationwide—where minorities made up at least 50 percent of the youth population. An additional 274 counties had minority youth populations between 40 percent and 50 percent, meaning that minority youth make up at least 40 percent of the under-20 population in nearly one in four counties. State license plates and tourism brochures boast that Utah ski areas receive the “greatest snow on Earth,” but is there really anything special about Utah's snow? 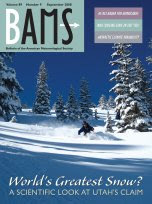 Often it is argued in ski industry brochures that Utah's snow is the greatest because it is the “driest” (i.e., has a low density or water content), yet the mean water content of snow at Alta ski area, which is world renowned for powder skiing and provides the cornerstone for Utah's famous slogan, is not lower than observed, for example, at many Colorado and Wyoming ski resorts. We propose that Alta's reputation is not based solely on mean water content, but also abundant natural snowfall. Although it cannot be shown that Utah's snow is the “greatest on Earth,” the climatology at Alta and other nearby ski areas is consistent with a high frequency of deep-powder days. Download the full article soon before it goes behind the gate. I have been poring over the sea surface temperature (SST) anomaly plots, trying to guess if the northern or southern storm tracks will be more active this winter. The only thing I know for certain is that I am not much of a snow prognosticator. There is a gold mine in environmental guilt but I am not sure carbon offsets does anything but assuage guilt. Mark and I have stayed at the Vintage Hotel in Winter Park, CO during the summer. We liked it so much, we talked about returning to it during ski season. Or perhaps one of the Summit County, CO condos? Or maybe staying liftside in one of the Cottonwood Canyon, UT condos? Iris' cousin spent a night at our house (along with her mom and their grandparents). It seemed like a good time to break out the bag we keep in Iris' closet for clothes and toys she wants to pass on to H. I am always sad when Iris outgrows something I made for her, like this miniature flannel robe with little muffins all over it. This is one cute rerun. Iris is wearing her new robe made of Liberty Tana Lawn, lined with French poodle-printed flannel. Ohh-la-la! I found the flannel at SAS and there was only a little remnant left. I bought some petal pink solid flannel at the Cotton Shop to finish the robe lining. I still need to make the pockets and tie belt before the robe is complete. The matching Tana Lawn nightgown has been cut out, but not sewn yet. For her third birthday, I made H her own heart dress. Iris' is in size 6, H's is in size 4. I let H loose in the fabric closet and she choose the fabric herself. Both robes are drafted from Kwik Sew Toddler or Children's sweatshirt patterns. I elongated the sweatshirts and flared them out slightly at the sides. Then I drew overlapping front pieces. But unlike many high-powered U.N. officials, Ogata never mastered the art of speaking at length while saying nothing. She even chided Japan for failing to be serious about humanitarian work. "I think it would be pretty good if Japan, in becoming an economic power, becomes a humanitarian power as well," she said just before she took office. Years later, she is still chiding Japan. What upsets her now, she said, is the government's failure to address the country's extraordinary demographic crisis. Japan has the world's oldest population and is projected to lose up to 70 percent of its workforce by 2050. Yet Japanese leaders have done "nothing" to increase immigration, "nothing" to ease the strain on working mothers and "nothing" to change a work-obsessed culture that keeps many young couples from having children, she said. "Everybody knew this was happening," she added. "Nothing was done. Do we have political leaders who are farsighted? No!" Recall this graphic from Is this the future? Look at the long tail of the kite. The very old and the very young need enormous amounts of care. That care falls exclusively on the shoulders of women. Ogata speaks the unfortunate truth. This society is in its death throes. Unless they both increase immigration AND make life less difficult for working mothers, their nation is dead.